"There used to be a small ski facility in the South Berkshire County private vacation community known as Leisure Lee, which is located in East Lee, just off Route 20 about 1 1/2 miles east of the Mass Tpke Exit 2, between Route 20 and Goose Pond. I have been a part time resident of Leisure Lee since 1988. When the community was developed by Barnum Development Corp. about 30 years ago, the facilities included a small ski hill, a ski chalet and a rope tow. They were located just off of Elk Drive. After several years the facilities were no longer used or maintained and the area has has been largely reclaimed by nature. For liability reasons, the ski house will soon be demolished." Joel King has more info: The Leisure Lee Ski area operated in the early to 70's to the winter of 1976. My family owned a home in Leisure Lee from 1976 - 1980 and had visited a couple of times since then. Leisure Lee is a vacation home development with an entrance on route 20 The lift was operated by the developer Jean Barnum or his son Jean, Jr. It was located about a 3/4ths of mile from the tennis courts. The ski area closed since the homeowners preferred the larger areas such as Butternut Basin, and Brodie. If you were a resident of Leisure Lee in the late 1970s please contact me jkling5644@dslextreme.com. 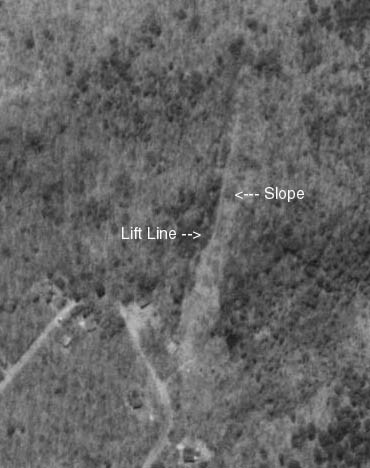 Above is a Terraserver overhead picture of the single slope area. You can clearly tell that it is growing in. This area is very close to the former Beartown Ski Area. Gerry Gauding: I skied there in the early days of Leisure Lee. My family built a house down close to the entrance of the development about 1970 or so, on a 3500 dollar lot. I think the address was 371 Antelope drive. Only the main road was paved. I only saw the lift actually operating about 2 or three times. It was a huge rope tow, and it was almost impossible to grasp that rope all the way to the top. The good part was since it was private, we used to take our skip-jack up instead of skis. It was an unreliable tow, at best. It's a shame they let the lodge fall into disrepair. Donald Gauding: The Gauding family built a cabin and vacationed at this site in the early 70s. Place was developed by Gene Delveco from Bridgeport Ct. Original plans included tennis courts and swimming-boating on Goose pond. Ski hill and shelter were built but never put into operation for as long as we stayed there. Several families from Fairfield County eventually built on the mountain side but winter access was treacherous. Later problems with wells and drainage forced us to sell in early 80s. Anybody else remember this area?